WordPress is the most popular and widely used Content Management System in the world. It is estimated that around 25% of all new websites published use WordPress and that there are as many as 75 million websites using WordPress worldwide. Originally thought of more as a blogging platform, WordPress can now be used to produce great looking and functional websites that do pretty much anything you need a website to do. We find it's a great platform for us to use in building our customers websites as it gives us all the functionality we require and allows our customers to update and add to the website themselves using the protected online admin area. Another great advantage to WordPress is the wide variety of plug-ins available mean that extending WordPress with new features is relatively easy. At Terranova we are experts in designing and implementing custom designed WordPress themes and providing our customers with a website which looks great and is easy for them to update themselves. We can either make an entirely new website for you, or if you already have a Wordpress site and simply want us to add anew custom design we can also do this for you. We can also design and implement a responsive design in Wordpress. Conservatory FX offer tiled conservatory roofs to customers throughout the North West. The company launched succesfully in 2012 with the help of our Wordpress based website and an ongoing adwords campaign we manage n their behalf. The website brings in a steady stream of new enquiries each week and has contributed to a succesfully first year for the company. 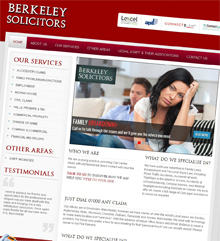 This Wordpress based, solicitor's website contains a wealth of information and advice on different aspects of English law. The website has a complete Content Management System allowing the site's owners to change all the text on the site as well as add articles to each of the main sections of the site very easily. The site also includes a conveyancing calculator, which calculates all the fees and disbursements involved in different conveyancing transactions at the click of a button. Droylsden Little Theatre, close to Manchester City Centre has a history going back to the 1920s. The site used a WordPress content management system and contains, news, social media plugins, details of future productions and a gallery of past shows. G1 Lifts install, repair and maintain a wide variety of lifts throughout the UK. This site uses a Wordpress contnet management system to allow the owners of the business to update the website themselves. As well as details of the different lifts G1 sell and install the site also showcases their maintenance work and 24 hour lift reapir service. Just Add Water Sports are a 5 star PADI diving centre & swimming academy. The site uses a WordPress content managemnt system allowing the site's owners to update the site themselves. Get in touch now so we can discuss your requirements.